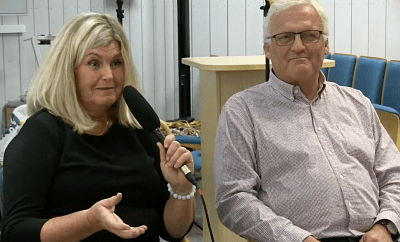 Join us for our highly anticipated follow-up interview with both Hans and Birgitta Mattsson during our recent trip to Sweden to visit with those who attended the original “Swedish Rescue” fireside in November, 2010. Our first interview with Hans and Birgitta was released on July 22, 2013 and is noted as one of our most important releases given Hans’ church leadership pedigree as a bishop and stake president in Sweden before serving in the LDS church 3rd Quorum of the Seventy from 2000-2005 in the Europe Central area under LDS Apostle L. Tom Perry, as well as the sincere struggles with testimony that both Hans and Birgitta faced after his release as an Area Authority. The idea of regarding a few families as the ‘Royalty” of the Mormon religious community is not unique to Mormonism. The Bahai communities of Europe, which were also developed by pioneers, also had highly respected families that were central to administrative and spiritual life. Oh my goodness. I loved this interview. I love and respect Bro and Sis Mattsson. They are simply amazing. Such courage to follow their heart and let the consequences follow. I wish them good health and continued happiness. What a beautiful and loving couple! I got chills when Brigitta said she chose Hans over the church. These two have hearts of gold and radiate love and truth. Thank you for interviewing them. I can’t wait to get their book! I would love to get a link to the Swedish version of the book. Can’t seem to find it online in the states. As a returned missionary who served in Sweden from 1998-2000, these interviews with these wonderful Swedes has been heartwarming. Please add a link to the Swedish language version!! Tack ska ni ha! At least they don’t have to worry about anything anymore. Celestial Glory is a given for them. Personally, I would like the second anointing to be an ordinance conducted as an act of kindness and even done as proxy for deceased ancestors. However, the only way I would like to see it carried out would be in the spirit of mentor / fan relationship. A mentor would pick a fellow Mormon and pass done the ordinance out of a kindred spirit relationship. A fan or perhaps better would be disciple/admirer would pick out a prominent member and ask to either perform the ordinance on behalf of a deceased ancestor or receive his/her own foot washing ordinance. I’m not sure if it was the curing acid while edging the cement of the garage floor preparing for epoxy, listening to this on my earbuds, but I misted up not once, but twice. I’ve listened to the previous podcast with Hans and Brigitta, and the Swedish Rescue just a day or two ago, but this one really touched me, thanks you two. Hans, you touched on something that I really identified on. The fact that there appears to exist within the church certain select ordinances available for just a few, usually the selected elite. The first one of these was polygamy. Polygamy described as the new and everlasting covenant, that BY ascribed to being necessary to the ascending to the highest levels, however seemingly limited to only be practiced by the higher circles, the connected elite, the future dynasty of apologetic dynastic fame. The second anointing is that same flavor, a practice of the highest brotherhood, the power couples of LDS inc. Hans you touched on the problem of what I term “selective saving ordinances”. The mathematics alone of polygamy was obvious enough to preclude only a few select actually practicing it, even then there were boys turned out of communities, and DNA lines blending unhealthily close. The natural outcome of the apologetic says “polygamy was only intended as a temporal practice, for a select few, to remedy the widow, and to replenish a (non existent) man/woman disparity. All of this yet an entire section in the Mormon cannon describing the practice as a “new and everlasting covenant”. To me, all of it flies in the face of a God claiming to be “no respecter of persons”, who “giveth liberally and abraideth not”, and if there was a plan, it would be for all of us to be shared in equally. It seems to me that if polygamy is needed, as both Joseph BY said it was for the highest echelons of glory, that it would be on offer to all who fought in the pre-existence for the Father plan, yet again the blessings of obedience to the law only on offer to a select few, the mathmatics of polygamy still not computing, and the blessings of a second anointed guaranteed heaven to only a select few. Now to be fair and show my cards, I don’t believe any of it and am all the way a non-believer, in religion and deity, but his was a shelf item for many years when I was fully in. However this church is leader centric, promoting leader worship, leader favor, leader deferment, and leader privilege, including solitary access to some saving ordinances. Hans and Brigitta, you are loving, giving, sincere, honest, people, and an example of the best part of the Mormon church. The fact that the church has lost you, and so many others like you, says volumes. I am not surprised that through it all, and despite the power the church has over people’s thinking which can pull families apart, you have been able to retain the love and respect of your children and grandchildren. Thank you for your courage. Your descendants may never fully appreciate how important for them it is that you have done what you have done. As you close a door today, it opens a window for tomorrow. Because of you, your children and grandchildren need not fear a marketplace of ideas where only that which can withstand scrutiny can survive. You have freed up future hearts and minds from the narrow thinking, tribalism, guilt, fear, manipulation, conformity, and blind obedience that a religious mindset and a religious organization can impose. What could make your children and grandchildren more proud of you, than for them to know how much you value integrity, independence of thought, and critical thinking? You have shown them that although seeking truth often means rocking the boat, being true to oneself is of paramount importance. Being honest with oneself and with others should never be sacrificed to group pressure, and should never be considered evil or disloyal. These are the lessons that your descendants might not learn in a church or in our society, because often our institutional leaders do not put openness and honesty first. I think that is because the weight and the temptations of power can warp their thinking. As Lord Acton (1834-1902), a British historian, wrote: “Power tends to corrupt, and absolute power corrupts absolutely. Great men are almost always bad man.” The terrible status of politics and of the presidency today in America contrasts radically with your example of integrity. Both of you are a breath of fresh air. It was so good to listen to your podcasts rather than the evening news. I wonder how many African Americans have had their second anointing, if any. I am truly grateful and thankful for you both! Your story has touched me and my families life beyond measure! We have experienced a faith crisis this last year. Your story and your willingness to speak out on real truths about the Mormon church helped us through our painful journey! You are an inspirational couple! You truly touched our hearts! We bought your book and loved it! Words cant express how thankful we are for you both! Much love to you both!!! Thankyou, Thankyou, Thankyou!!! !